Hyderabad, India (02 December 2014). A new research agreement was signed today between the Horticulture Innovation Australia (HIA) and the International Crops Research Institute for the Semi-Arid-Tropics (ICRISAT) at the institute’s global headquarters in Hyderabad, India. The Memorandum of Understanding (MoU) will allow researchers from ICRISAT and Australian agencies to undertake joint research and development (R&D) in plant genomics for the first time through HIA. 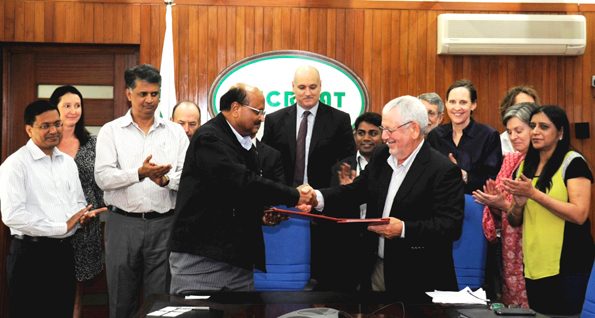 The agreement was signed by Mr David Cliffe, HIA Director and Dr William Dar, ICRISAT Director General.